Ironing is one of several ways to remove wrinkles from shirts. Even the best-laid laundry plans sometimes result in wrinkled shirts. Washers and dryers are wonderful, no doubt, but overload them or leave your clothes in them for too long, and your shirts are bound to come out wrinkled. Natural fabrics, such as cotton and linen, wrinkle more easily, and shirts packed in suitcases or left hanging in an overstuffed closet for too long will also wrinkle. Yes, wrinkles are waiting for you everywhere -- thankfully they're not permanent and can be removed in a number of ways. But, regardless of your chosen wrinkle-banishing technique, always check the shirt's care tag before employing it, as some fabrics require special treatment. Let's face it -- ironing is a chore. But it's an effective and straightforward way to remove wrinkles from shirts. If the fabric tag indicates that the shirt is safe to iron, match up the fabric content with the heat setting on the iron. 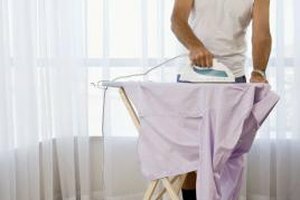 A slightly damp shirt is more receptive to wrinkle removal with an iron. If the shirt is dry, use the steam setting on the iron or sprinkle the shirt with a little water -- a water-filled spray bottle is excellent for this purpose. Begin ironing with the shirt collar and move on to the sleeves, back and front. Hang the shirt up immediately after ironing. If it's a button-down shirt, always button the top and center buttons. In the nightmare, you're in a hotel room with a wrinkled shirt -- and no iron. But fear not, you can use a shower to steam most of the wrinkles out of most shirts. 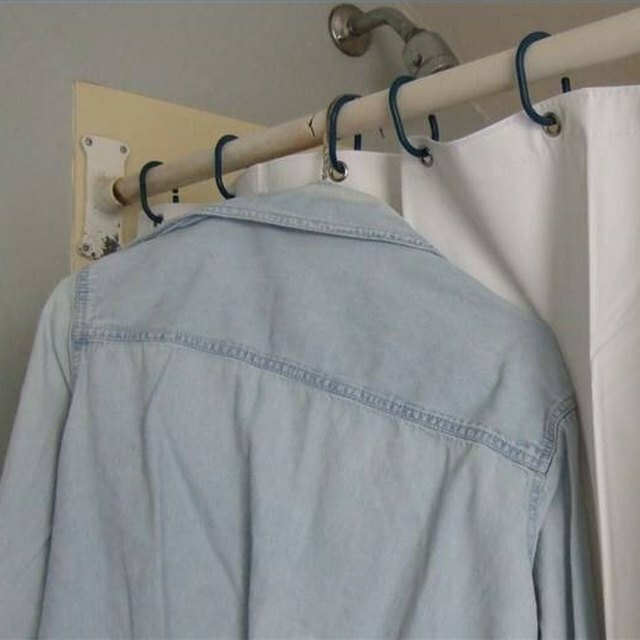 Hang the shirt on the shower rod or another spot in the bathroom where air can circulate around it. If it's a collared shirt, turn the collar up so the steam can get under it. Turn the shower on at the hottest water setting. Leave the bathroom, shutting the door behind you. Run the shower for a full minute, then go in and turn it off. Leave the shirt in the closed bathroom for another five minutes or until the steam dissipates. Hang the shirt up in a non-steamy room to dry before wearing. Use a hand-held hair dryer to remove wrinkles from a shirt. Hang the shirt in a spot where you can easily get to all sides of it and turn the collar up. Soak a wash rag in warm water, wring it out and wipe the shirt with it, concentrating on the wrinkles. Then grasp the shirt tails and pull down -- making the shirt taut -- and go over the shirt with the hair dryer on the hot setting. Dry the sleeves in the same manner, pulling the sleeves taut by grasping the sleeve cuffs. Pull the points of the collar out while drying to get a smooth finish. Remove wrinkles from shirts using one of the several wrinkle-release products available in supermarkets. Hang up the shirt and spray the product over the shirt in even motions while pulling the fabric taut. Allow the shirt to dry. You also can make your own wrinkle releaser at home by mixing one teaspoon of liquid fabric softener with one cup of water -- tap water is suitable but distilled water works better. Pour the mixture into a spray bottle, ideally one that has a fine-mist nozzle, and use your homemade product in the same way you would use a commercial wrinkle releaser.